What a sweet little cutie pie I had come visit me! It was so nice to see this little guy in the studio! We had done his 3-month session outdoors last fall at Burr Oaks in Blue Springs. I think that was the first time he really got out and sat in grass. That is always a riot, they are completely perplexed by that new texture and the surroundings. This time, mom wanted a little variety for this next session. 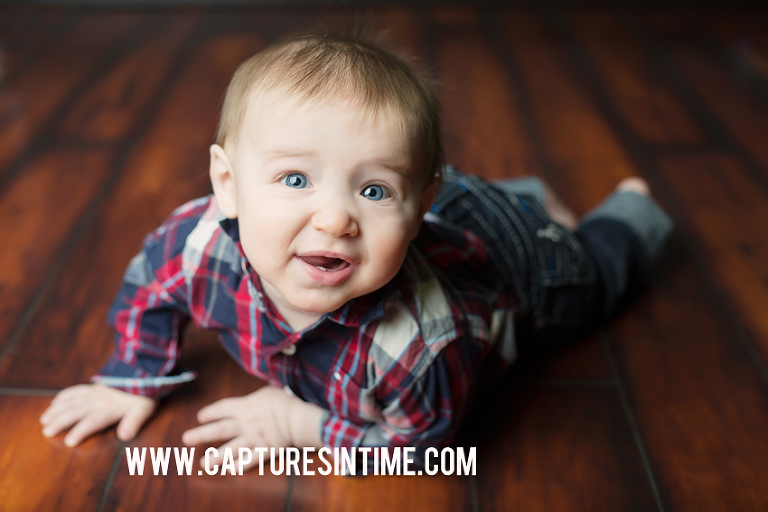 There is nothing like some studio light in those big eyes of a baby and those cute little teeth coming in! 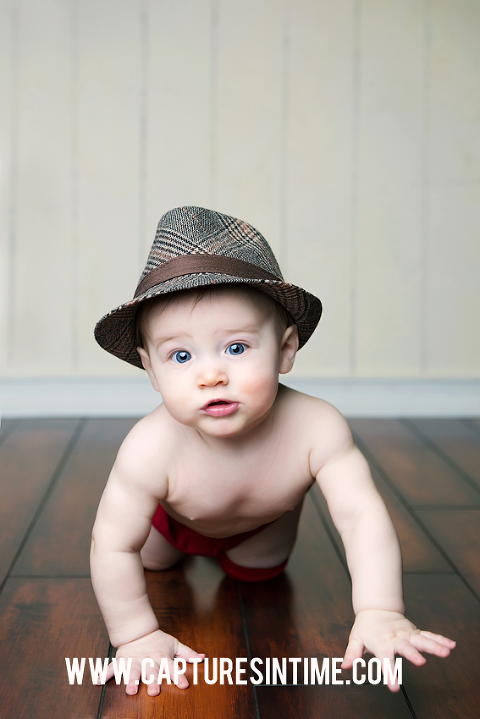 You just have to shoot in the studio at least once when you have a child under one! What a riot with this face in the first shot. He pushed himself right up in that tub. When we do shots like this, where baby is “in” something and they are at the age where they could certainly get “out” of it very easily if they wanted, mom is always CLOSE by. Very close. We always have a spotter and baby safety is always my number one concern. Sometimes, I have to edit out a close hand and that is ok! This clawfoot vintage bathtub is a client favorite. There is a funny story about this bathtub. I ordered it from a very high-quality vendor and it finally came. This was no $50 bathtub, let me tell you. It came to the house and I unpackaged it, I was so excited. I turn around to get something from the kitchen and come back in the entryway and there he is, my 160 lb husband, fully clothed in this bathtub. I could hardly speak, I don’t know what the weight limit is on this thing, it is apparently really high. It’s a sturdy prop! TESTED!